How To Pose For Wedding Pictures? While many of the best photos from the wedding you attend will be candid shots, there will always be a posed photo shoot, if you are a member of the wedding party. 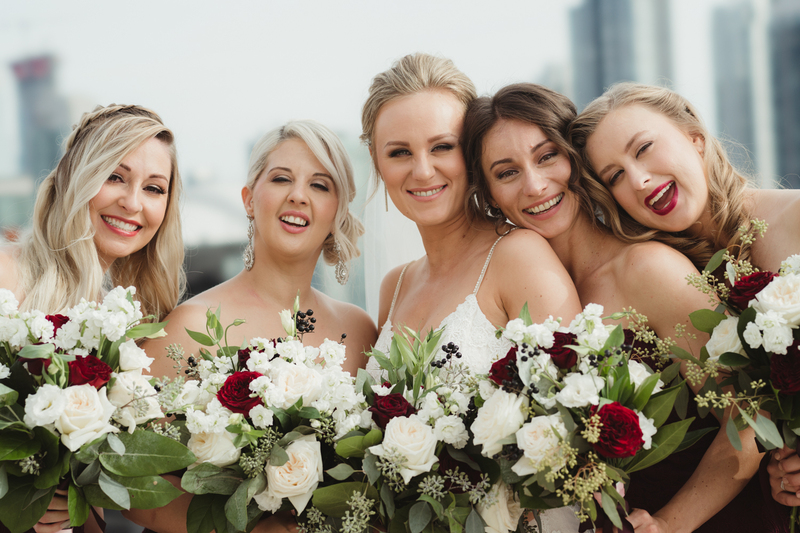 During this time the photographer will take the wedding party to a suitable location, a park, urban setting, a place of natural or historic charm, and begin to take group shots as well as portraits of the wedding party. A few things are important to keep in mind during this time, including camera eye contact, body language, wardrobe, and staying with the group. Looking into the camera is normal for posed shots, but which camera? There can sometimes be other guests with cellphones, or their own cameras, also participating in the photo shoot as the photographer poses the wedding party. This can create the problem of several people in the photo each looking a different way, very distracting in a photo. To create the best results and look your best in your friends’ wedding album, look into the photographer’s camera during the official shoot. Your friend can take their own picture of you when the photographer has moved on to other subjects. This will save time and help all photos look their best. Body language is very important, especially in wide group shots that show everyone head to toe. It is important to keep good posture in mind. The photographer will position each individual within the group based on height and other considerations, to make the image and everyone in it look as good as possible. Slouching or trying to get into the photo from the back row by standing on your toes, can ruin an otherwise memorable photo. The photographer will often give you tips as detailed as how to put your hands in your pockets to look your best, or let you know to fix your tie. Take their advice as everything will be seen from the camera’s point of view, and it may see something you yourself cannot. One of the main elements of a wide group shot is the wardrobe its subjects are wearing. As they often appear in the photo head to toe, the colour and style of the clothing is a main factor in how the photo will turn out. A well chosen wardrobe for the wedding can even give the photographer ideas on locations and backgrounds to pose you against. Avoid thin line, or zebra patterns, as these often create problems with digital cameras. Solid colours are always a better option. Matching or complementing your date can also help make you the photographer’s favourite guests. However, something too attention grabbing is not good, as it can distract from your friend’s wedding, where they should be the main focus. Finally, staying with the group is important, as less time spent waiting on everyone who should be in the photo means more time to perfect the shot. Keep up with the photographer as they lead the group to the location, and follow their instructions to make sure the event stays on time and the photos all turn out their best.